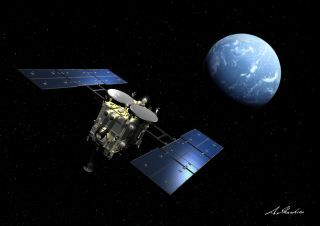 An artist's illustration of Japan's Hayabusa2 asteroid probe near Earth. The spacecraft flew by Earth on Dec. 3, 2015 to get a speed boost on the way to visit an asteroid in 2018. A Japanese spacecraft buzzed Earth on Thursday (Dec. 3) on its way to meet an asteroid in a few years. It's too early to say if the asteroid-bound Hayabusa2 probe is on the correct path after its closest approach at 6:08 a.m. EST today (Dec. 3), officials said. But that information will be known soon, the Japan Aerospace Exploration Agency (JAXA) said. The goal of the flyby was to use Earth's gravitational pull to give Hayabusa2 a speed boost, helping the craft make its 2018 date with the asteroid Ryugu. During the flyby, Hayabusa2 captured stunning photos of Earth from space, which JAXA combined into an animated image. "After its closest flight to the Earth, we have confirmed the good health of the Hayabusa2," JAXA officials wrote in a statement. "It will take about a week to confirm if the explorer entered the target orbit." Hayabusa2 launched in December 2014. It is on a six-year journey to meet up with asteroid Ryugu (formerly known as 1999 JU3) in 2018. The probe will stick around Ryugu for about 18 months, send several landers to the asteroid's surface and even pick up a sample for return to Earth by 2020. The spacecraft is a follow-on from the Hayabusa mission, which explored the asteroid Itokawa and successfully returned samples to Earth in 2010. Hayabusa was the first mission to return samples from any object outside the Earth, aside from the moon. Ryugu is a C-type asteroid that is expected to have more organic and hydrated materials than does Itokawa, an S-type asteroid, JAXA officials wrote on the agency's website. Studying Ryugu is expected to yield more information on how organic matter and water behave in the solar system. Also listening to the approach was a European Space Agency radio dish in Malargüe, Argentina, and a NASA station in Canberra, Australia. Hayabusa2 will be the first Japanese mission that ESA tracks in deep space. This will allow for a greater science return, since ESA has dishes that can pick up Hayabusa2 when the spacecraft is out of range of Japan.